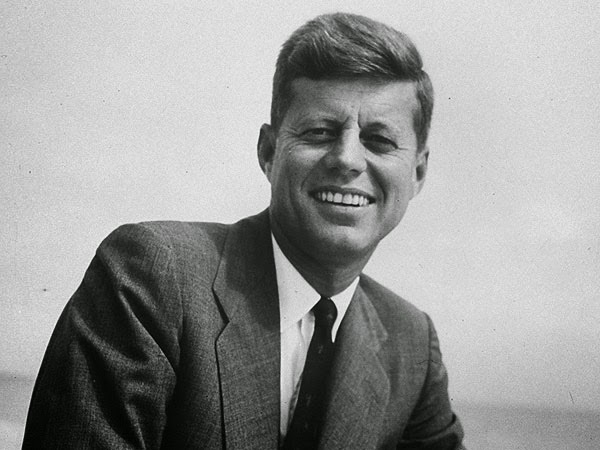 John Kennedy, even with his publicly reported physical frailties, was a man with an almost mythical presence. He was young and vibrant, he had a beautiful wife and two small children, and, true or not, we perceived him as the peoples' president--as close to being one of us, his wealth notwithstanding, as we were likely to get. He was the FDR we had been wishing for. It was accepted, we thought, that modern American presidents didn't die from assassin's bullets. It was unthinkable. But John Kennedy did. Walter Cronkite broke the news to us and we were forced to believe it: At 1:00 P.M. Central Standard Time, on November 22, 1963, in Parkland Hospital, Dallas, Texas, the president died . Not long after the announcement my seven-year-old ran into the house, wild-eyed and gasping. "The principal said we had to go home," my daughter told us. "They said to hurry. I was so scared." My little girl ran all the way, a half-mile from the school to our house. Her fears were local; she couldn't fathom that much commotion unless it meant that something bad had happened to her family. The death of a president was not something she needed to worry about, but the sight of her sobbing mother made her knees buckle and she joined in, crying because I was crying. I cried for three days; not continuously, since we had two small children who needed reassuring, but my daughter, middle-aged now, remembers that for the first time in her life she felt fear in her own house. The TV was on from morning until night. We watched Lyndon Johnson being sworn in as president aboard Air Force One. Too soon. Too soon! We're not ready to call him president. Impossible to avoid the bloodstains on Jackie's pink bouclé suit as she stood silent nearby. It seemed such a brave, foolish, poignant thing to do, to continue to wear that suit still showing traces of her husband's splattered brain. Even those who had seen the First Lady as a bit of an extraneous butterfly now held her to their hearts. We watched the funeral--the riderless horse; Jackie in her heavy black veil, eyes hollow, staring straight ahead as John's grieving brother, Robert, held her arm; John-John, sweet little boy, saluting his father's casket. We watched as a procession of dignitaries followed along behind, someone's somber voice announcing their names as they passed by the television cameras. For a few brief moments we found respite in trying to identify the Washington celebrities by sight before they were announced. But, as happened many times throughout those terrible days, reality set in: Our president, Jack Kennedy, had been murdered. Later we watched the assassin Lee Harvey Oswald enter the jail, arms held by two armed guards, and then watched in horror as a man, later identified as Jack Ruby, lunged in front of the camera and shot Oswald dead. Rumors flew; it was a conspiracy and not the work of a lone gunman. Oswald knew too much. Ruby had ties to the mob. Castro had orchestrated this from Cuba. The Soviets were involved. Others would die. Nobody was safe. We didn't lose our innocence on that day. We hadn't been living in a fairy tale world. We had lived through WWII, had feared the Hydrogen Bomb, had been glued to the TV during the Cuban Missile Crisis, had watched as our country botched the invasion at the Bay of Pigs. U.S troops were in Vietnam and anti-war rallies were sprouting up all over the country. The civil rights movement was growing and with it came long-hidden truths about the institutionalized brutality against blacks. We lived with uncertainty, but it was tempered and presented to us in black and white on our televisions and in the pages of Life Magazine. We had no 24-hour-a-day news channels. No internet. Our newspapers were thick with other things to distract us. We could turn it on and turn it off. But on November 22, 1963 everything changed. We were embarking on a journey with a new president nobody wanted and nobody trusted. Our fear turned to cynicism and instead of a country held together by the pain of an assassination, we became a country torn apart by anger and distrust. The Warren Report, the exhaustive study of the Kennedy assassination, brought more doubt than closure. Three civil rights workers were murdered the following year in Mississippi and the South became a furious battleground. Vietnam war protesters took to the streets by the thousands as the war escalated and the draft forced our children into deadly battles they couldn't believe in. The underground drug culture came up for air and flourished. And in 1968, five years after John Kennedy was killed, we lost two more good men to assassins' bullets--Bobby Kennedy and Martin Luther King. We'll never know where we would be today if on that fated day in November those bullets fired from the Dallas Book Depository hadn't hit their mark, but we do know we didn't get over it. We couldn't close the book; we couldn't change the channel. Our president had been assassinated and for far too long afterward our world was an ugly place. Now, 51 years later, we're hearing about White House breaches where people with weapons are getting too close to our president before they're stopped and the same fear surfaces from a half-century ago. I'm afraid for Barack Obama. The level of murderous hatred toward this man is far beyond anything I've ever witnessed in my lifetime. I would like to think much of it is an act, made easier because one can remain hidden and anonymous and penalty-free on the internet, but I know all it takes is one lone gunman hell-bent on killing the president. I want every person who ever publicly threatens the president, or wishes out loud for his death, to be found and questioned and made to prove he or she has no real intentions. I want those threats to be taken seriously. I want us to stop interpreting the First Amendment to mean there are no consequences for advocating for the death of the President of the United States. We have given the highest honor in the land--the presidency--to a man named Barack Obama. He is a good man, but even if he weren't, we, as citizens of the country he was elected to head, have an obligation to make sure our president is kept safe. This president. Any president. I also worry about Obama, especially since the Secret Service was ordered to "stand down" during one invasion. Who owns them? Who is trying to have him killed? Thank you, Katy. I don't know why any sane person would ever want to be president! The revelations about the shoddy work by the Secret Service is troubling, for sure, and if any president needs to be protected 24/7 it's this one, but I don't read a conspiracy into it. I remember that day so very well, teachers at my school were weeping as they put us on the bus to go home early. I was in Texas at the time -- at Ft. Hood. My mother slapped me for a liar when I got home and informed her as to why I was there so early. Like you, I felt it was a pivotal moment when something changed. I sadly now wonder if 9-11 serves that 'marker' purpose for a younger generation. So It Happened And It Was Bad. No Quitting Now.